Triple your storage space! Compress, store and organise with the Flexi Storage vacuum bags. 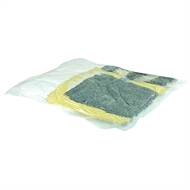 Airtight and offering protection for your things, they are ideal for blankets, duvets, jumpers, pillows and other bulky items.